Microsoft has revealed that it will be bringing its Edge browser to both iOS and Android. 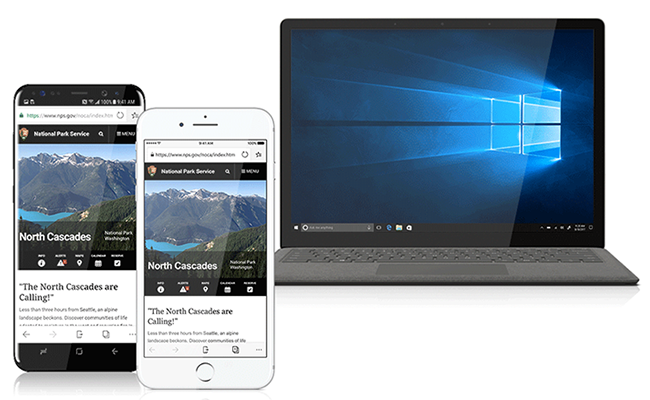 Announced by Joe Belfiore, Corporate VP for Windows and Devices at Microsoft, in a blog post, the new mobile-friendly versions of Edge are designed to help you synchronise your browser activity between your smartphone and PC. The launch is currently best described as limited, however. Edge for iOS is available today, but only as a preview via Apple TestFlight, while the Android version is simply said to be 'coming soon'. It's also currently in US-English only, but Microsoft says language support will expand as the preview continues. Larger devices (iPads and Android tablets) are also not supported at launch. Finally, the Continue on PC function will only be enabled in the Windows 10 Fall Creators Update, so only those on Microsoft's Windows Insiders programme can take advantage for now. Regardless, if you're still interested in having a play, you can sign up to preview both version at this link. In the same post, Microsoft also unveiled that its 'Arrow Launcher' project for Android is being updated and renamed to Microsoft Launcher. They can just French Connection UK out of here if they think I'm putting it anywhere near my android phone. I think they should at least make Edge the best browser on their own OS before they start on others. I read elsewhere that what MS are calling Edge is just a frontend for each OS's standard browser backend.